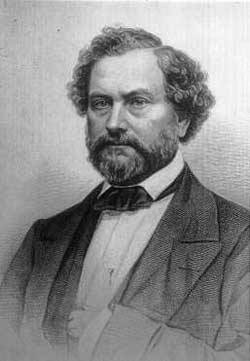 Samuel Colt (July 19, 1814 - January 10, 1862) was an American inventor and industrialist, who is today best remembered as the creator of one of the most popular gun designs in the history of the world - six-barreled Colt pistol called "revolver". As a founder of" Colt's Patent Fire-Arms Manufacturing Company" (today known as "Colt's Manufacturing Company") he greatly popularized the use of interchangeable parts, assembly lines and simple gun designs which made him one of the most influential and wealthiest industrialists of his time. According to many historians, his successes and contributions in the field of military arms paved the way for the expansion of America influence across the world. Samuel was born in Hartford, Connecticut as a son of a Christopher Colt. After the death of Samuel's mother Sarah Colt (née Caldwell) Christopher remarried to Olive Sergeant. His family counted eight children. Three of his daughters did not live to be married, and they all died in childhood or committed suicides later in life. His sons however managed to live long lives, except for John C. Colt who in 1841 killed a prospector in New York City. He was promptly captured and sentenced to death by the court, but he managed to kill himself on a day of execution. After spending early life as a farmer, Christopher Colt moved his family to Hartford where he started his career as a businessman. Education of young Samuel Colt started in age 11, when he was sent to the farm in Glastonbury where he did chores and attended school. There he first came to contact with the scientific encyclopedia book "Compendium of Knowledge" which captured his imagination and solidified his wish to become famous inventor. In the pages of that book he found the history of gunpowder and the interesting lives of Robert Fulton (inventor of the first commercially successful steamboat and first submarine) and other inventors. The most important thing that this book imprinted in young Colt's mind was the notion that these and many other inventors managed to accomplish things that were deemed to be impossible. During his time on Glastonbury farm he first came to idea to make an impossible gun - one which is able to shoot more than one bullet without manual reloading. At the age of 15, Colt started working in his father textile plant in Massachusetts, where he used accessible tools, materials and experienced factory workers to work in his ideas. In those years he managed to create homemade galvanic cell which he used to test the gunpowder charges near the Ware Lake. In 1832, his farther sent him to learn a sea trade on a merchant ship, and it was there that Samuel conceived the initial designs of his rotating gun barrel. While serving on first voyage on the ship, he noticed the movement of the ship's wheel, and was insipid to create similar rotating concept for loading bullets in front of the main firing barrel. 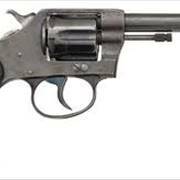 According to the words of Colt himself, "regardless of which way the wheel was spun, each spoke always came in direct line with a clutch that could be set to hold it... the revolver was conceived!" He immediately began designing the basic shape of a gun, and before returning home he managed to make a wooden model of a revolver. After returning to the Massachusetts, he presented his designs to his father who was not impressed with the idea, but he eventually financed the production of first to pistols. Sadly, those two guns were made in very poor quality (after the wishes of the Christopher Colt to use inexpensive and not experienced mechanics). One of those guns exploded upon firing, and the other one refused to fire at all. To obtain money required for the construction of the proper guns with the help of professional gunsmiths in Baltimore, Colt started touring the USA and Canada as the public demonstrator of the laughing gas. At the age of 18, he applied for a patent on his revolver, with a promise that he would soon deliver working model. In 1835, Samuel Colt went to England where he hoped to learn more about the interesting rifle designs that were made by the inventor Elisha Collier. There he inspected Collier's revolving flintlock models, and applied for a patent for his revolver. Even though English officials were reluctant to issue a patent, in the end Colt managed to receive one. In America, he soon established a firearm manufacturing factory in Paterson, New Jersey. After securing patent rights in the US on 25 February 1836 and August 29, 1836, he managed to protect basic principles of his revolver (revolving-breech loading and folding trigger). His design improved the popular revolving flint rifle models of Elisha Collier (which were very popular in Europe), and enabled the price of the gun to be much lower than before. All of its parts were intended to be made by a machine, easily replaceable, and easily assembled at the factory with the small workforce (via the assembly line). During his life, Samuel Colt managed to forever change the way of how the weapon industry worked. His vision of user replaceable parts, mass produces interchangeable parts, revolving firing chamber and the creation of the first “Colt” pistol paved the way for all of the modern firearms that we use today. 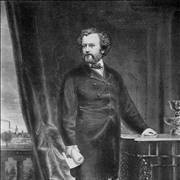 Read about Samuel Colt facts, biography, his company and other information. The first commercial model of a revolver that was made by Samuel Colt was named "Colt Paterson" and it featured revolving chamber that housed five bullets of .28 and .36 calibers. Although it was easy to use, it had one big flaw - the loading mechanism was not advanced enough and users had to partially disassemble the gun to reload it. Few years later in 1839, Colt added a capping window which enabled the user to reload the gun without disassembling it. 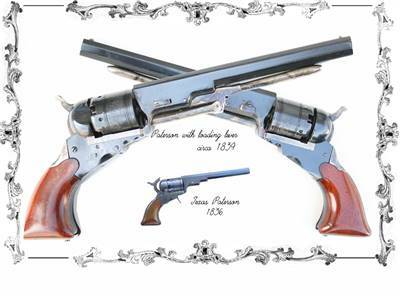 After the release of "Colt Paterson", Samuel Colt decided that he needed to raise money for a machine that would make all of the gun's interchangeable parts. He went on the road and started promoting his revolver across the America. Seeing that this tactic is not paying off, he went straight to Washington D.C., and presented his invention to the American President Andrew Jackson. With his help he received the started promoting his gun directly to the military and senate, sadly with little success. He found out that the "Militia Act of 1808" doesn't not allow him to sell his revolvers directly to the local militias, and slow manufacturing time led him to cancel lucrative order of 75 pistols for the state of South Carolina. The economic crash of 1837 under the presidency of Martin Van Buren almost led to the bankruptcy of the Colt's business. His company was saved however with the rise of the war against the Seminoles in Florida. He provided his revolvers and revolving muskets to the soldiers in Florida, who loved these new weapons but they also found few flaws. Untrained soldiers had great difficulty reloading their weapons, and they often managed to completely lock or break some parts of the gun. In the following years Colt continued to improve the designs of his "Colt Peterson", until 1843 when he ran out of funds and was forced to close his manufacturing factory in New Jersey. After the end of his first phase of gun making, Samuel Colt focused himself in the creation underwater electrical detonators and cables. Created with the help of the fellow inventor Samuel Morse, they both lobbied to the US Government to provide funding for the creation of the underwater cable that could be used to send telegraph messages between the America to Europe. During those years, Colt manufactured large quantities of waterproof cable, which was used across all America (under various lakes, rivers and bays). By the end of 1841 Colt finally received funds from the US military to create the prototype for underwater mine. In 1842 he successfully demonstrated his technology to the US President John Tyler, but the opposing force from the Senate left him without military contract. Soon after, Colt was forced to return to the gun making business when Captain Samuel Walker of the Texas Rangers placed the order of over 1000 guns for his soldiers that fought in Mexican-American War. Colt soon established new manufacturing plant, and with the help of Samuel Walker and engineer Eli Whitney Blake, they designed the famous gun model called "Colt Walker". Powered by the large .44 caliber bullet, enforced firing chamber, and long barrel, this gun became the most powerful handgun ever created at that time. Variations of this gun remained in production all until 1935, when the famous .357 Magnum started to be used. After the initial order of 1000 guns, and another 1000 more, new factory of Samuel Colt at Hartford, Connecticut became stable and ever-growing. During the following years they manufactured the guns for several conflicts in the US, and the ensuing California gold rush and western expansion created unseen demand for his guns. In 1852, for the first time Colt received competition in the Allen & Thurber gun making company. After the court battle, Colt won his case in which he claimed that Allen & Thurber infringed on his patents and he was awarded with the royalties from each of their gun that was sold. This caused the eventual stop of production by Allen & Thurber, and Colt remained the only manufacturer in the US. During that time he expanded his sale to the Europe, where he offered his gun to various countries that had tense international relations. He told each country that their enemies were buying his guns, which enabled him to sell everyone very large quantities of his product. 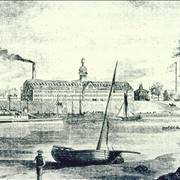 Around 1855, Samuel Colt started the construction of his new factory along the Connecticut River, near Hartford, Connecticut. This complex called Colt Armory consistent of big manufacturing plant, employee housing area, club "Charter Oak Hall" where his workforce could rest, and a manor called "Armsmear". After 1864 fire, East Armory was rebuilt and since then Colt Armory worked on the manufacture of many gun and arms models, but also it was used for the manufacture of many other items (most notably letterpress printing presses that are even today regarded for the quality of their manufacture). Before the start of the US Civil War, Colt married Elizabeth Jarvis, the daughter of the Reverend William Jarvis who lived near Hartford. He was drafted into the army in the rank of Colonel on May 16, 1861, but he never entered into combat. He died soon after the war on January 10, 1862, at the age of 47. At the time of his death he was the wealthiest US inventor (with estimated wealth of around 15 million dollars), and most certainly inventor who influenced the rise of the entire war industry. His designs continue to live on in the following centuries, and his "Colt's Manufacturing Company" continues to thrive and innovate even today. Some of the most important gun designs that were made in the Colt's Manufacturing Company during the centuries are Colt-Browning Model 1895 (first operational gas--actuated machine gun), Thompson Submachine gun Mod 1921 (which was very popular in the age of US Prohibition, where many policeman and gangster used it), and Colt CMG-1 and CMG-2 machine guns which became main weapon of the US army during 1960s.